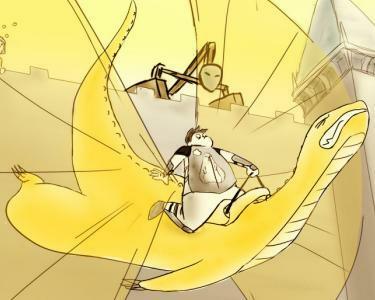 Banana is the Yellow Dwagon that Parson tried to fly during his picnic, much to its discomfort. Apparently dwagons (and most non sentient creatures) are not named on Erfworld, as this engendered some confusion when Parson named the dwagon. Parson's experience as heavy unit with trying to fly was significant in the strategy used in the Battle for Spacerock (Capital of the Jetstone side) to allow Gobwin Knob to establish control over the Atrium. This page was last edited on 21 December 2014, at 15:04.